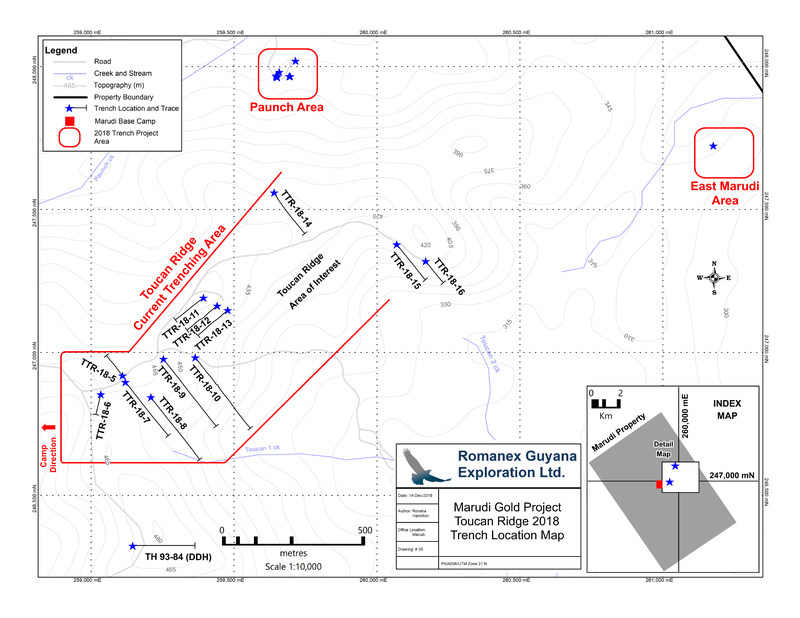 February 5, 2019 / TheNewswire / Vancouver, Canada - Guyana Goldstrike Inc. (the "Company" or "Guyana Goldstrike") (TSXV: GYA, OTC: GYNAF, FSE:1ZT) is pleased to report high-grade assays from trench TTR-18-10 at the Toucan Ridge area on its Marudi Gold Project ("Marudi" or the "Property") located in the Guiana Gold Belt, Guyana, South America. 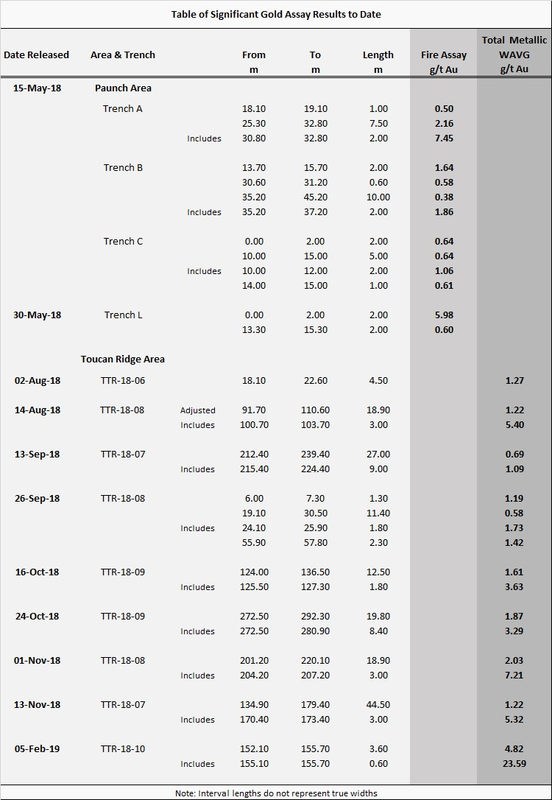 Please view below, "Table of Significant Gold Assay Results to Date" for a list of all trenching results on the Property to date, and "Toucan Ridge Location Map" for the location of the Toucan Ridge area of interest and related trenches. For information concerning the mineral resource estimate and the project, readers are encouraged to review "Technical Report: Marudi Property Mazoa Hill Mineral Resource Estimate", a technical report prepared for the Company by Global Mineral Resource Services and is available at (Click Here)and under the Company's profile on SEDAR www.sedar.com. All samples collected during the trenching program were delivered by Guyana Goldstrike personnel to Activation Laboratories Ltd. (Actlabs), located in Georgetown, Guyana. Actlabs is ISO 17025 accredited and an ISO 9001:2008 qualified and certified assayer that performs and makes available internal assaying controls. Actlabs has more than 25 years' experience and maintains complete analytical laboratories that perform high quality analysis for many industries around the world. Certified blanks and standards are systematically used in the trenching program as part of Guyana Goldstrike's quality assurance/quality control (QA/QC) program. One blank and one standard are inserted into sample shipments at every 20th sample. Duplicates are also inserted into sample shipments.